Probably the highlight of me week was when my co-worker brought in a Tall Kitchen garbage bag full of half of a llama fleece for me! She had a full fleece in her closet and she offered me half of it. For free! I was so excited to get it. I reasearched a little bit and found some info on how to prepare a llama fleece. 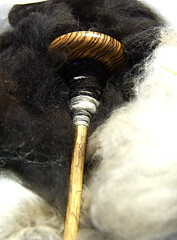 Some websites stated that they don’t have a greasy fleece, like wool does, so you don’t really have to wash it first. They do suggest combing. My boss’s friend raises llamas so I e-mailed her to ask her what to do with it and she did suggest washing it because llamas like to roll around in the dirt so the fleece can be a bit dusty. So have I done any of that? No. I couldn’t wait to wash and comb it so I just decided to start spinning some of it up. Just to see. It is a little dusty but it hasn’t been too bad. It’s so pretty though. So soft. And lovely to spin. The other thing I did this weekend was weave my fist scarf! It really looks crappy but I don’t care. I learned a lot. So that’s good. 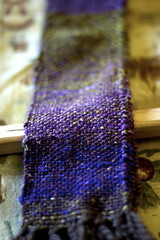 I used Noro Silk Garden for the weft and Cascade Eco wool for the warp. 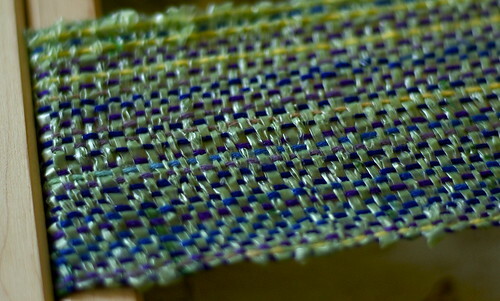 I learned that the warp really needs to be tight if you want a good weave. So I will need to figure out how to make a tighter warp. I decided to start weaving a fabric out of plastic grocery bags. For the warp I used a hideous sock yarn from KnitPicks that I’ve had in my stash for years. It actually is turning out really nice! I’m going to sew a few of these strips together into a fabric to make a shopping bag.